Fall is the time for vampy colors. 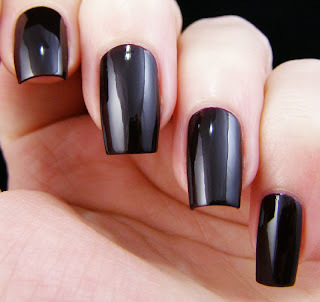 Dark lips, dark clothes, and dark nails are in...in a big way. But if you are on a budget, it's often hard to get in on the trends and still stay within your budget. I'm on a serious no/low-buy for the foreseeable future, so I was overjoyed to find this color at CVS...and on sale! NYC is so overlooked as a brand when it comes to polish. It has a lovely range of regular and fast dry colors, all at terrific prices. This particular bottle retails for 99 cents at CVS...and I got it during a buy one, get one 50% off sale. Can't argue with less than 50 cents for an on-trend color. 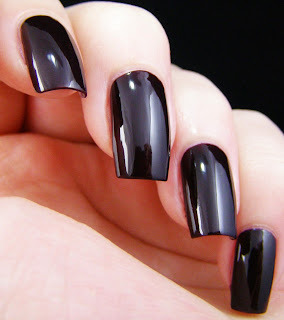 This would be a lovely SFW color for fall as well. It also applies so nicely. I used two medium coats, and there are no bald spots to see. It's also got a very Goldilocks consistency: not so thick that it prevents a smooth application and not so thin that it floods the cuticles. I am in LOVE. It's fabulously glossy too. Can you believe I didn't use a topcoat at all here? Tl;dr is go grab it. You won't be sorry. outside the lightbox. Look at that shine!